UNTILL THE DEATH of Annie Chapman, the people of Whitechapel shrugged off the murders with the same numb fatalism they adopted to deal with their day-to-day privations. The Hanbury Street killing changed things dramatically. Fear spread through the district and beyond into the city. The frantic search redoubled for “Leather Apron”, mistakenly thought to be the owner of the items found at the murder scene. By day, Whitechapel oddly reveled in its sudden celebrity; excited crowds massed at key locations, paying money to get a good view of the murder sites, police stations and mortuary. By night it was a different matter. When shops closed their shutters and put out the gaslight, folk scurried to their lodgings, locking themselves in with newly-bought keys. The courts and alleys were silent, echoing only to the footsteps of police patrols. Nevertheless, prostitutes with no doss money were still forced onto streets, but many of them migrated to better-lit areas or sought shelter in charitable casual wards. Unfortunates with no such option carried knives and said their prayers. Some sadistic “jokers” took delight in mimicking the Ripper, waving knives in the faces of women. In some cases the shock itself proved fatal. Lurking fear could turn to rage and paranoia in an instant. Amid constant rumours of arrests and sightings, suspicious-looking innocents were chased for their lives through the street. Whitechapel was home to many immigrant Jews, and mob anger took an anti-Semitic turn. To combat this, on 10 September the Mile End Vigilance Committee was set up, largely of Jewish tradesmen, offering a reward to anyone helping bring the murder to justice. Other vigilance groups followed. As September progressed with no further deaths, the panic subsided. Rumours went around that the killer had gone elsewhere. 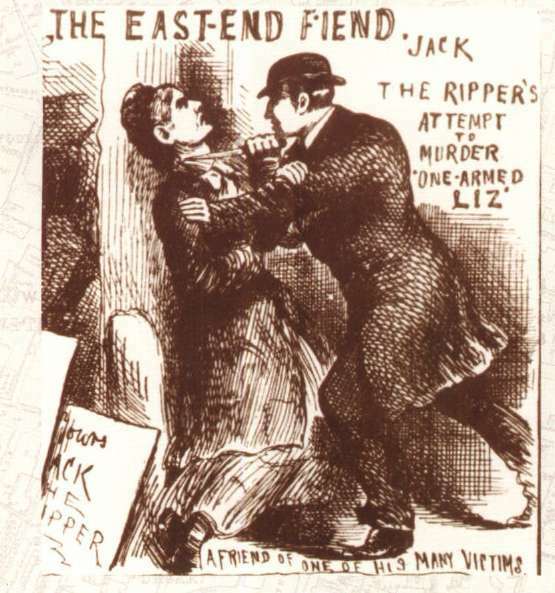 But early on the 30th, the Ripper struck again – twice. ELIZABETH STRIDE was found with her throat cut in a yard off Berner Street. 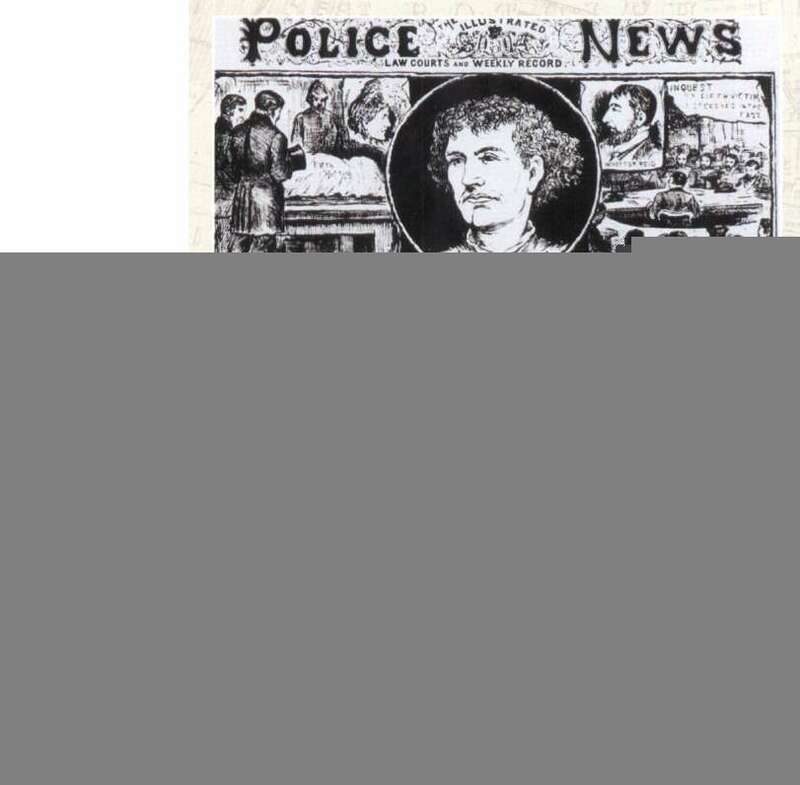 Less than an hour later, and less than a mile away PC Edward Watkins shone his lantern on the butchered body of another woman of the streets, CATHERINE EDDOWES. Her throat too had been cut and her body ripped open more appallingly than any of the previous murders. A portion of Eddowe’s bloodstained apron was found in a nearby street, and, next to it, a chalked message: “The Juwes are the Men That Will not be Blamed for nothing”. As a result, journalistic hysteria reached a new pitch and the apathy of Whitechapel folk finally turned to anger at the lack of progress in any of the cases. The popular press reflected the horror and frustration of the time. 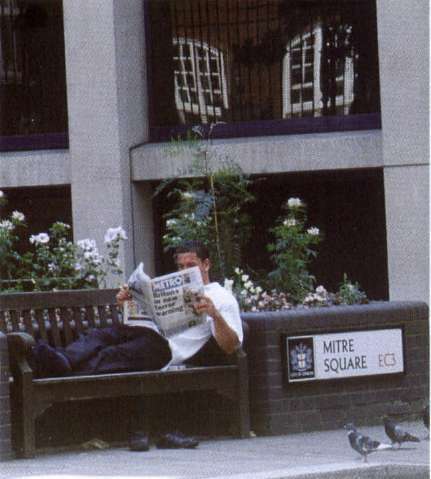 The present-day scene of Catherine Eddowes’ murder.